Police in Mexico say they have seized a "narco-tank", a pickup truck fitted with steel armour that is thought to have been used by a drugs gang. 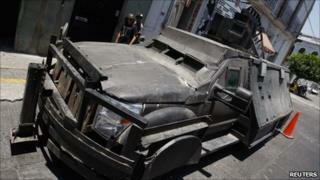 The home-made armoured vehicle was found in the western state of Jalisco. It had metal reinforcements fitted to its front, and a metal cabin covering the rear platform, presumably to protect passengers from gunfire. The security forces often complain that the drug gangs they battle are better armed and equipped than they are. The vehicle was found abandoned in a rural area of Jalisco, where criminal gangs have been fighting with the security forces and each other. Jalisco was the stronghold of the late drug baron Ignacio "Nacho" Coronel, a top member of the Sinaloa cartel. Since he was killed by the security forces in July 2010, Jalisco has seen a violent battle for control of the area between members of the Sinaloa cartel and their rivals from the Cartel de Jalisco Nueva Generacion.